The Japanese warriors from ancient history were varied and plentiful, however two classes come to mind when you think Japanese warrior. The first of these popular Japanese legends is the Samurai, the once bodyguards and hired help who eventually rose to prominence and ruled over feudal Japan. The other is of course the master of stealth, the Japanese assassins, the Ninja. The Ninja was the shadow in the night that would carry out the stealth missions that no one else was capable of, using their nimble dexterity and alarming array of tools and weapons. Of course, these two classes were not the only warriors in Japan, and this country would offer much more from warrior pirates to martial artist monks. The Sohei and Yamabushi were two of the religious fighting warriors from Japan, and the Wokou were the dangerous and sneaky warrior pirates that roamed the oceans off the shores of Japan. Many skills were even thought to be common between many of these warriors, for example the Ninja and Yamabushi shared many mental skills that allowed them to stay calm and focused in any situation. The variety and range of skills that they possessed make the Japanese warriors some of the most interesting to ever do battle, and of course we will be revealing all they key details that make these intriguing warriors so unique. As we alluded to previously Japan offered up plenty of warriors classes that covered a mix of skills, traditions and approaches. We will investigate and detail them all from the legendary Ninja warriors to the Japanese warrior pirates, the Wokou. The ninja is of course one of the most popular Japanese warriors to ever exist. The ninja were masters of the ancient art of ninjitsu, and would have to learn the 18 skills it encompassed to become a real master of many skills. These mysterious warriors were highly sought after with their unique skills being of high value to the feudal lords of the time in Japan. 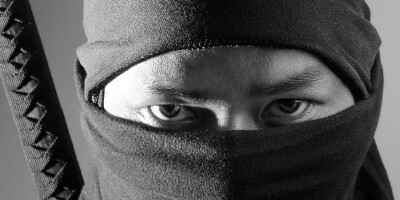 The ninja started with secretive training, passed down from clan to clan. The ryo’s as they were known were the home of this training, and with the growth of the desire for the ninja skills, the ryos grew in size and popularity. With this popularity came more work, with the ninja proving the go-to warrior for many looking to take out their foes with silent but deadly intent. The mighty rulers of Japan, the samurai were a dominant warrior culture and force in feudal Japan. What is interesting about these famed warriors is their humble beginnings. The origin of the samurai can be traced back to the 7th and 8th century, where roughly a quarter of all able bodied males were required to be drafted into the Japanese military. This lead to the creation of a ranking system with 12 levels, any warrior below rank 6 was actually coined a ‘samurai’. Later these warriors would grow in numbers, and they would become employed in wars over the battle for land between the ruling clans of the time. As the demand for warriors skills in this wild times continued, the samurai developed not only their fighting skills, but their ethical codes. Over time these noble warriors would come to rule over Japan, a true warrior class for the ages. These seemingly peaceful mountain hermits while deeply religious, were also highly skilled in martial arts and deadly warriors in their own right. The yamabushi were students of many things, and their secluded home in the mountain was the perfect place for them to master their skills in the martial arts. While it is hard to pin down exactly what martial art, or which type of techniques they practised, it’s thought that one was the art of sumo, along with various other armed and unarmed combat skills. There is also a lot of information on how the yamabushi influenced many other classes of Japanese warriors, in particular the ninja warriors who shared many skill sets with the yamabushi. If you think of the a warrior monk, then the Sohei are probably what you are imagining. These Buddhist warrior monks who lived in feudal Japan were both peaceful but powerful. Even though the tradition of Buddhism follows a more pacifistic approach to life with the five precepts which were the ethical guidelines of Buddhism, the Sohei were very much products of their time. The Sohei were realistic in their approach to life, wanting peace but happy to fight should the need arise. These warrior monks were not afraid to arm themselves with the tools, weapons and armour suitable of the time, that allowed them to compete with the powerful Samurai warriors on many occasion. The famous warrior pirates of Asia, the Wokou were both merchants, raiders, smugglers and ronin. The Wokou were famed for their ocean escapades, their name was literally translated to ‘dwarf bandit’ and came to prominence in the 13th century when they would attack on the shores of Korea, much to the dismay of the Korean leaders of the time. The diversity of the Japanese warriors is what stands out most to us. Not only does Japan have one iconic warrior class in the deadly and mysterious Shinobis, the Ninja, it also has another legendary warrior class in the mighty Samurai. Throw in the peaceful but deadly warrior monks the sohei, the mountain hermits the yamabushi, and the relentless piracy of the Wokou and you have a mix of warriors that would stand strong against any nation.